So yesterday we had a great game session where the characters ventured out into the wilderness in the pursuit of various adventure hooks, some campaign-specific and some plainly mercenary. There were forgotten ruins, great stone heads vomiting poisonous snakes, a griffin attack on the party’s lone horse thwarted by a very fortunate gust of wind spell, mountain lakes with magical ice, a mud pit full of giant leeches a PC just walked into, and mysterious stone circles with runic messages. A good time was had by all. The evening before yesterday, I was panicking over a blank piece of paper and The Tome of Adventure Design, trying to make a few feeble sparks of creativity catch on fire while the clock was ticking away. That happens every time I write a wilderness adventure, and no matter the practice and the fact that I’m quite good at running them, it doesn’t get much better. Writing wilderness adventures is surprisingly hard if we don’t fall back on a few overused concepts (which I’ll discuss below). There is a good reason so many D&D adventures take place in dungeons, and that’s not just because descending into a mysterious underworld full of danger and riches is such a compelling idea. Dungeons are one of the most successful game structures, balancing ease of use with a lot of potential for complexity and depth. And of course, a lot of the rules (including spell descriptions) apply to dungeons, or are formulated in the context of dungeons. Dungeons gave us the original language for location-based adventures, and this legacy shows up in most game materials, even those that don’t describe dungeons per se, but look and feel like them anyway. “Dungeon-likes” may be the most common form of RPG scenario next to mission-based ones. Sadly, the OD&D booklets never developed a comparably powerful engine for adventuring above ground. There are a lot of fascinating ideas scattered in the text of The Underworld & Wilderness Adventures which outline some kind of implied setting, but I am not sure Gary & Co. ever used them that cohesively or comprehensively. Whatever its virtues, it didn’t catch the popular imagination and was pretty much forgotten until interest was rekindled in OD&D in the 2000s. Pretty much the same happened to Judges Guild’s simple and amazingly functional campaign hexagon system – there are a lot of hex maps in 1980s and 1990s game products, but they are vestigial, used only to measure distances, and not to structure and run game space. On the other side of the coin, the wilderness exploration guidelines in the AD&D Dungeon Masters Guide don’t form a complete system: they are disconnected ideas which relate to running a wilderness, but don’t present clear procedures you should follow in play. In the end, more space in the DMG is dedicated to aerial combat than designing a wilderness. 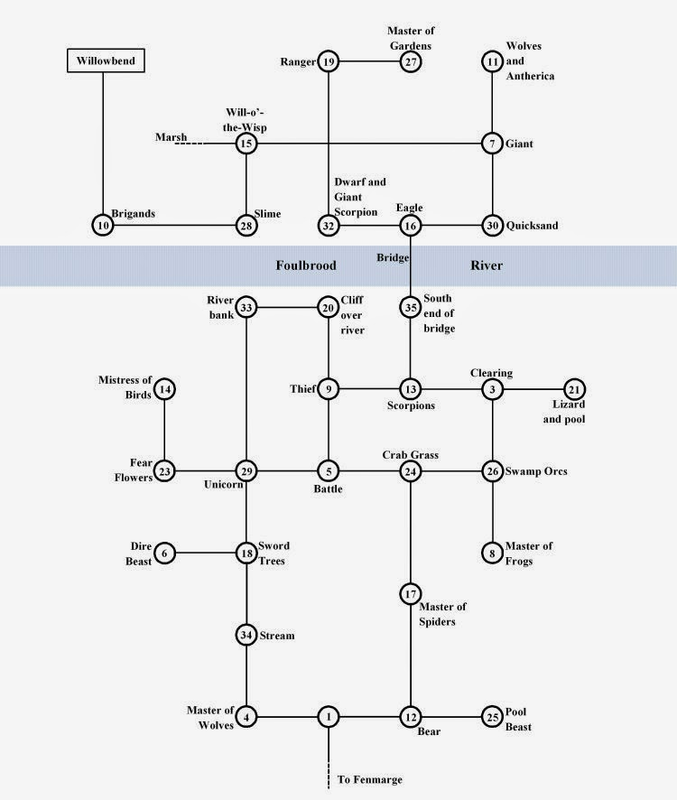 The Fighting Fantasy gamebook series had the great Scorpion Swamp by Steve Jackson (the American one), which mapped a swamp on a square grid consisting of “clearings”, each with some kind of encounter in it. This was perhaps the best model for a non-linear wilderness game, but it didn’t really cross-pollinate tabletop games. We know a lot about the megadungeon (“the mythic underworld”), but we don’t even have an approximately developed idea about the... megawilderness (Moorcock called it “the exotic landscape” in Wizardry and Wild Romance). 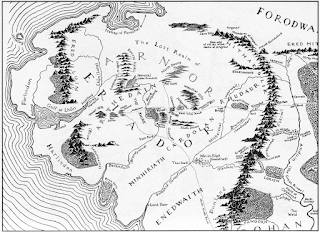 The wilderness as a place of fantastic dangers, natural wonders, monstrous adversaries and lost history has even more precedents in fantasy literature than big dungeons, and wilderness maps are a very big thing in fantasy fandom, but it has not been distilled into a coherent package of rules, guidelines and building blocks. The closest is the hex-crawl, which gives you large-scale travel based on day-to-day movements on a hex map, features of interest to explore, and random encounter charts to complicate things. It is the best way I know to run grand expeditions. But even the mighty Judges Guild stumbled when it came to packaging a smaller piece of wilderness into an adventure. Hexes fail when they are applied to finer terrain (there is both too many and not enough of them), and that doesn’t even cover filling the wilderness with interesting encounters. The consequences have been with us ever since. Where running a place consisting of connected rooms and passages has established standards and a lot of helpful techniques and idea generators, the same does not apply to running an open landscape. In the absence of translating the idea of traversing fantastic landscapes and discovering danger and riches therein into a gameable thing, we have a tendency to reach for crutches and substitutes. Another substitute for deep wilderness action is to populate the wilderness with dungeons instead of treating it as one. This is the classic case of falling back on familiar modes of play to avoid getting tangled up in a less defined one. Mini-dungeons are easy to develop on a tight time budget, and they give a good bang for the buck. But the moment you are entering a mini-dungeon is also the moment you are exiting the wilderness. You can even see it in Wilderlands of High Fantasy, whose wilderness is populated with “Citadels & Castles”, “Ruins & Relics”, “Idyllic Islands” and “Lurid Lairs”. They are very much about non-wildernessy things you find in the wilderness. The third substitute is to use monster encounters, and lots of them. This is largely logical – you stock a dungeon with dungeon monsters, and you stock a wilderness with wilderness monsters. The monsters have lairs and they can also be found roaming at random and maybe having conflicts and interactions with each other. But just like a dungeon filled with monster closets feels one-note, so does a wilderness filled with monster closets. Perhaps we are still missing the forest for the trees? So then what about true wilderness play? There is no big solution in this post, and some of it feels a bit obvious to restate – but here it goes. It should be something analogous to a developed dungeon, but use the fantastic game logic of the exotic landscape instead of the fantastic game logic of the mythic underworld. It should be intuitively understandable and easy to replicate in preparation and play. Here are just a few things which I think deserve thought and attention. There should be a robust movement system to help players navigate. 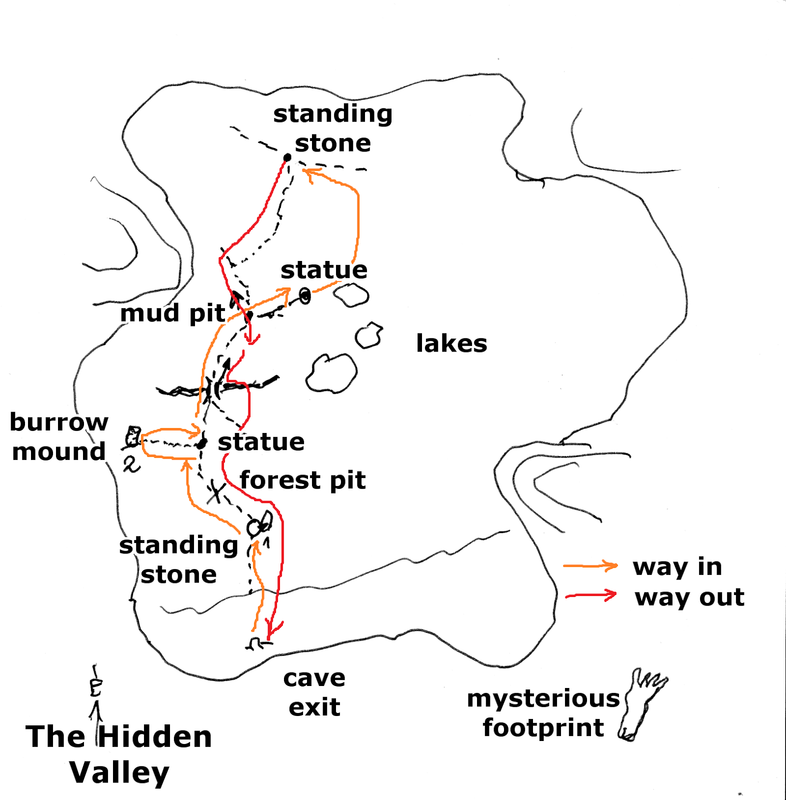 This can be a combination of the point-crawl (a system of lines connecting encounters in an interesting way, like a dungeon’s corridors and rooms), landmark-based navigation (approaching, avoiding, or leaving behind natural and man-made landmarks and distinct terrain features), and compass-based movement (move in any of the eight cardinal and ordinal directions). This system should be gamey, but flexible, with broad applicability. No need to figure movement points or cross-reference encumbrance with terrain types, but there should be a way to let both the GM and the players describe the party’s movement through the wilds in simple terms. It is useful to have good, simple procedures for exploration. Dungeoneering procedures tell you how to get across a chasm, keep an expedition’s progress lit, batter down a door and so on. Likewise, wilderness procedures should tell us about foraging for food, keeping watch at night, navigating a treacherous mountain trail, taking care of pack animals, and spotting important landmarks from a distance. None of these should be more complicated than a few routine player decisions and a few dice rolls – after all, the emphasis is on dangerous and fantastic things, and the exploration procedures serve to ground them in a sense of reality. Connected to the previous point, there is perhaps some need to reconsider game rules from the wilderness perspective. This is not a new thing, since things worked differently in OD&D’s dungeons and wilderness sections, but it has been only inadequately explored. If, say, spells were written with the dungeon in mind, how do they work in a forest? In the mountains? Can I lift a fallen tree from our path with an open doors check? But above all, we should reconsider what makes a good wilderness encounter. Beyond monster encounters, dungeons have flavour (dungeon dressing), traps, tricks and enigmas. What are the equivalents out on a wilderness site? This is the main question. Of course, a lot of dungeon accoutrements have a place in the wilderness. Mysterious statues, glittering pools, or deep chasms with something interesting down on the bottom feel as much at home in an enchanted forest as in the underworld. Mechanical traps and secret doors are harder to find counterparts for. Treacherous ground? Malevolent vegetation? Something hidden in the roots of a massive tree? These should be encounters where the characters can observe, experiment, and come up with unorthodox ideas to cut Gordian knots. How do we get across a raging river? Do we take the slippery-looking and altogether too convenient bridge, or do we create our own rope bridge? How do we investigate a seemingly abandoned hut? These open questions make for memorable adventures full of improvisation and ‘Eureka!’ moments. The greatest potential lies in putting ideas from adventure novels, movies, mythology and fantasy into the context of a magical, gamified landscape, and mashing them up until they are their own thing. These are the equivalents of the true dungeon trick/enigma, like the enchanted field, the tree laden with different kinds of magical fruits, the burial grove where the long dead rise to consult the living, and many such ideas. They are not about the literal translation of original concepts, but creating something new through the power of dream logic and loose association. It is somewhere in these foundations that we will find the true idea of the megawilderness, and give it a form we can bottle and distribute to other gamers. I have been moving towards a heavier use of landmarks in overland travel. Since we are using skills, we have a reliable way to determine if the lookouts have spotted something interesting. Sosem készült el, de egyszer gondolkodtam egy mocsárvidék megtervezésén. A területen csatornák hálózata az utak, a kiemelkedő szigeteken találhatók objektumok, a fennmaradó, kitöltő textúra a nádas, ami gyakorlatilag áthatolhatatlan/biztos eltévedés/túlságosan hosszas kevergést jelent. A titkosajtók a nádason átvezető rejtett vízi utak, melyeket meg kell találni. Az egész közepén rejtőzik egy város, ami a csempészek, rablók és szerencsejátékosok központja a kontinensen. Hasonlóan lerajzolható, mint egy hagyományos barlangrendszer. Síkságra a távolságok és a landmarkok jellemzőek, nincs eltévedés a nagy látótávolság, a nyílt terep miatt, itt nagyon hasznosak a lovak. A hegyvidékek is leírhatók a járható ösvények és kiszélesedő völgyek hálózataként (a Helvéczia térképek ilyennek tűntek). Plusz hegycsúcsok és a felvezető ösvények a csúcstámadáshoz. Lehet, hogy bizonyos területeket meg kell rajzolni, mint egy dungeont, másokat csak felskiccelni a harmadikat hexekre osztani. Az egy út probléma megoldható azzal, hogy nincs út, de azzal is, hogy elmondjuk: számos útelágazódás van, dobjatok, hogy megtaláljátok-e a helyeset, vagy sem. Egyes "hexek" működhetnek úgy, mint titkos szobák, amikbe nagyon nehéz betalálni, vagy csak eltévedés dobás eredményeként lehet bejutni, stb. Sokban közelít a vadon a dungeonhoz, ha van áthatolhatatlan struktúra, mint a dungeonban a falak. Jó! :) Le is fordítom az angol olvasók kedvéért. A mocsaras megoldás nagyon érdekes; sokkal kisebb léptékben foglalkoztam csak vele (egy magyarul még meg nem jelent kalandmodul vadonban játszódó része tartalmaz hasonlókat, de az csak pár oldalas bevezető). A Helvéczia térképein valóban a völgyek jelentik a fő irányokat, bár néhány játékunkban ennél finomabb skálán is mozogtak a karakterek. Az eltévedéssel vannak gondjaink, mivel mesélőként én térképezek. It was never finished, but I once thought about laying out a marshland. The network of channels crisscrossing the territory would form the roads, the protruding islands would hold the features of interest, and the remaining “filler” texture would be reeds, essentially a zone that’d be impenetrable or you’d be surely lost or wander around for far too long. Secret doors would be hidden waterways through the reeds, which would have to be found [before using them]. In the middle of it all lies a town, the hub of smugglers, brigands and gamblers on the continent. 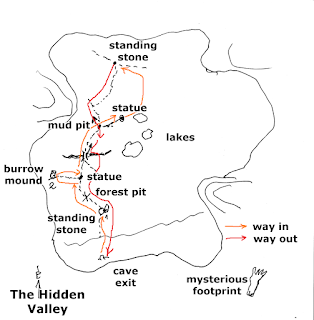 All of this could be drawn like a traditional cave system. Plains are characterised by distances and landmarks; there is no chance of being lost due to open terrain, and horses become very useful. Mountains can be described as a network of passable trails and wider valleys (the maps of Helvéczia seem to be similar). You can add peaks and paths leading up to them for peak ascent. Woodlands and wooded hills are relatively permeable, but you can’t see out of them, making it easy to lose your way. This can make getting lost an important element. This could mean it is hard to pass from one hex into another, or hard to leave hex on the same side you entered. This is some kind of random wandering. A secret door simply means a path in the right direction. It is possible that some areas should be drawn like dungeons, others simply sketched, and a third type divided into hexes. The “one way” problem can be solved by having no roads, but also if we tell [the players] that there are numerous branches, roll to find the right one. Some “hexes” could work as secret rooms, which are very hard to enter, or they can only be entered after getting lost, etc. Wilderness areas become similar to dungeons if there is an impermeable structure similar to walls. There was the AD&D 1st ed. hardback Wilderness Survival Guide, but it fell pretty flat as I recall. You got more rules for weather, random encounters, wilderness types, nonweapon proficiencies and whatnot, but precious little about making the wilderness a gaming environment. At least the Easley cover art looks good. The WSG (and its companion, the Dungeoneers' Survival Guide) were all but useless for this purpose, except for a fairly good underworld setting. The same stuff is found in JG's Ready Ref Sheets in a shorter, easier, and much more user-friendly way. Another thing about roads: if you want to get from one place to another and you have a road between them, lo and behold, your most logical choice is to walk down that road. No reason to wander off to uncharted bogs (you will have plenty of danger at your destination or just along the road, more than likely) at all, so blaming the players for a logical choice looks a bit absurd. There is an element of truth there, but then again, who wants to live forever? Boring people! And a third thing about, well, not the wilderness: how many megadungeons (or just plain dungeons) can one name from classic fantasy lit? 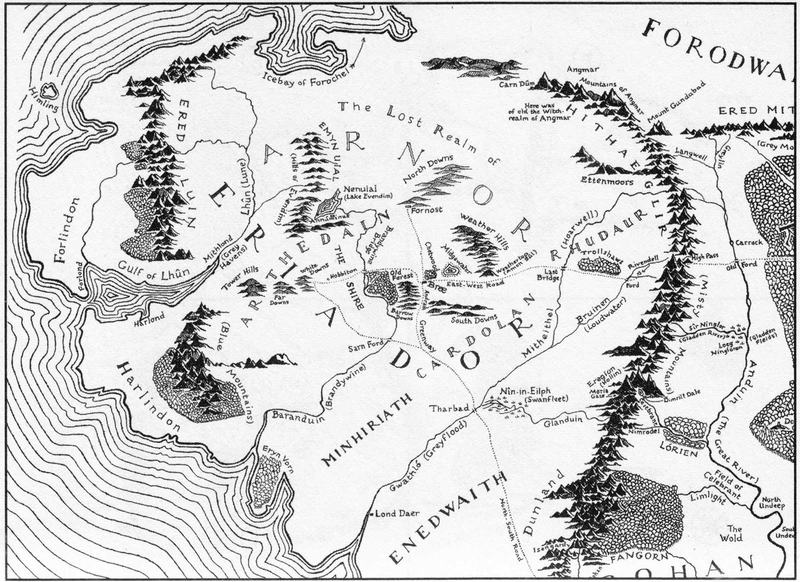 Moria comes to mind, even though it isn't very detailed by Tolkien (and on the top of that, the party's disposition is decidedly un-D&D-like, instead of plunder and exploration, they just want to slip through, and fast); Erebor may qualify (loads of loot, a big beefy boss monster, a single secret door), but what else? If you don't mind it being fundamentally above ground (but still having a very megadungeon-like structure), Gormenghast. - ...and the seminal brigand-inhabited caves under Khyber Pass from King -- of the Khyber Rifles (Talbot Mundy, 1916). Pretty sure some of the ERB stories contain something similar, but I haven't read too many of them. Also, H. Rider Haggard must have written something about labyrinthine lost cities in King Solomon's Mines or She (pretty sure that's where the idea comes from), but then I haven't read his stuff either. Note that unlike LotR, the protagonists of these yarns don't tend to think twice about looting these lost places (or wooing the exotic women who tend to rule them! :)). Sorry for the necro, but I like digging through the archives for inspiration sometimes. In King Solomon's Mines, which I read probably 5 times as a lad, the titular dungeon is somewhat large (the heroes get lost), but totally uninhabited. It's more of a trap really as I recall, they almost starve to death with the diamonds before they find a way out. Most of the book is spent on wilderness adventuring and faction play! Procedural: Supply (or tease) maps to the players frequently! Outdoor adventuring implies certain features seen long distances away. And around the more civilized areas, people will commonly know certain points of interest. Get this info into the players’ hands visually, even if crude and somewhat vague. Make the presence of more detailed (though not always accurate) maps known, possibly available for a price, or by adventuring (steal it). Procedural: Instead of homogenous hexes, build the map using variable size spaces. Spaces would work similarly to hexes, but are not actually hexagonal; each space represents typical overland travel distance per time unit, for some definition of “typical.” So mountain and dense forest spaces would be smaller than spaces containing roads or open, level terrain. (IIRC various folks have blogged about this in the last 10 years; don’t have links handy though.) Air travel can be handled with a ruler. Procedural & Design: Include secret/hidden stuff frequently enough to make searching worthwhile. Or link the chances of discovering secret/hidden stuff to other rolls the players already need (like foraging). Or at least hint when searching might be likely to uncover things: Include the presence of ruined foundations, overgrown roads, or other hints of civilizations or natural features. Design your special features to take advantage of patterns: IMC, various stone circles (usually an indicator of an adventure site) occur at standard intervals along straight lines; the players haven’t figured this out yet, so this particular example may be too obtuse. Procedural: Encode the discoverability of keyed areas into each area description. Some might be obvious. Others could be n-in-6 per period of searching. Any feature could have different layers of discoverability: Certain elements/clues may be automatically discovered, whereas deeper clues and/or the full feature may only have a chance. Consider that any space may have multiple features, so a searching mechanic probably requires multiple dice, just in case, and the referee always rolls the multiples (to keep the players guessing): The first die to determine whether the party finds a clue/feature, and the second roll for which feature. For comprehensive searches of a space (or hex), document the amount of time needed to find it with 100% certainty (this could be in days, weeks, months, etc.). Design: Exploit vantage points and use long sight-lines when designing. It’s okay to accept the conceit of repeatedly starting players with a high perspective, so you can give them an overview map of a new area. Or, in a wilderness module, instead of the insane wizard digging successive levels downward, he raises a massive tower (maybe even with lights visible at night). Design: The enormous scale and sight lines beg for enormous consequences. Include things to affect, or be affected by the terrain, or to take advantage of the sign: A shimmering cyclopean magical barrier holds back an ominous sea-full of water at one end of the valley; or like the Eye of Mordor (from the films, anyway), a terrible power might notice you at a distance, thus affecting how/whether you choose to move within an area. Design: Add reasons to alter the types of creatures in an area, whether by eliminating or encouraging them. (This kind of goes along with the enormous consequences idea.) The bent/alignment of creatures within a region might affect the way magic works, or the types of foliage, or the types of other wandering monsters, or the flow of water, or even the casting level of the terrible sorcerer who plucks the head of a townsman on every new moon. Maybe everyone knows this or maybe they don’t. This probably dovetails into the domain establishment guidelines too. As I'm sure you recall, Victor Raymond wrote a series of posts on ODD74 as a sequel of sorts to Roger Musson's "Dungeon Architect" pieces from the early days of White Dwarf. They're worth digging up: http://odd74.proboards.com/thread/786/wilderness-architect (as are Musson's, of course). If we mash together your thoughts with Victor's, we may begin to arrive at something akin to the guidelines you're suggesting we define. Add some fantastical sensibilities grounded in Moorcock and Farmer, Melville and Hawthorne, and players (and their characters) will begin to appreciate the terror that the Wild inspired in our ancestors. Such guidelines would start to approach the fantastical in a more natural and familiar environ, and move gradually into more unnatural and surreal ones as civilization is left further and further behind. Ley lines and the gradual movement into Faery-like environs of Moorcock's Middle Marches and Ars Magica's Regio pale as the other planes intrude (extrude?) into the mundane Prime Material world; as tainted and cursed lands destroyed by magical apocalypses (magical radiation?) ---and now filled with now-mutated lifeforms adapted to the hostile environment---replace the familiar Borderlands and its Keep; the environment and attrition become the greatest threats as PCs juggle and manage (or magically create) the resources required to survive long expeditions; the unfamiliar eclipses the known as the Wilderness eventually moves into the planar multiverse. The scale of threats in the wild should increase as the strangitude of the landscapes do, making PCs wish for safely-bounded holes to crawl back into: monsters leverage the lair-based terrifying encounters from the MM's No. Appearing ranges as hundreds of humanoids vie with families of dragons and giants; armies on the march conscript PCs or hang them as spies; as our laws and theories of science erode in the face of the whims of gods and demons, druids and dragons. Allan -- I have actually stolen Moorcock's "Mittelmarch" idea for Helvéczia, where these surreal and otherworldly landscapes overlap an already fantastic late 17th century Switzerland. It is a good approach to work from. Distance from civilisation and its logic are a good way to think about it and . Oh boy. The rulebook is essentially done, as is one of the supplements and half of the starting module. - actually publishing the damn thing in a way that reaches an audience, doesn't bankrupt me, and looks and feels like intended. It is the second question which vexes me. I have essentially put the project on hold while I set up an enterprise and try a test balloon in the form of a reasonably inexpensive product (my zine). If it works, it may be time to discuss Helvéczia. This is something I'm working at. Some thoughts: The wilderness is of a different scale than the Dungeon. So the challenges and phenomena can be of a different scale, too (a much underused concept!). I think the hexagon-model did a disservice to that thought. All but the most dedicated and hard-core hex-crawl DMs shied away from a regular tesselation. 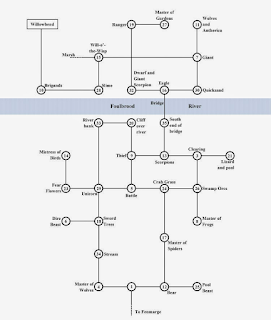 The forest that is hidden by the trees: The dungeon structure is not so useful because of it's graph structure as a a discretization of movement choices which map to decision points. That is only a small part of it. No, the biggest increase in usefulness when moving from Free Kriegsspiel (or rather Strategos N) into the dungeons below Branstein Castle was the radical reduction of spatial-content. The dungeon is about the whitespace highlighting the few rooms. Not about the corridors (edges) connecting the rooms (vertices). Reduction/collapse of a continuum (terrain) into easily countable and mentally manipulatable discrete chunks(rooms). When we move into the wilderness, we should not think about again discretizing a continous phenomenon into one-dimensopnal vertices again! We should generalize its features into differently scaled phenomena that exist at the same time, but take different kind of encounters/scenes/procedures to interact with (at each scale). Some people do this intuitively, and it will be good. Gygax has at least two scales for all spells and movement (indoor vs outdoors fireballs for ex.) There is room for making these processes more explicit, as Melan said. And, an irregular tesselation, like an area-movement map in wargames, seems to be the way to go for most DMs. To explicitly add in my thought about scale dependent phenomena, one should add a hierarchy of discrete phenomena on top of the irregular tesselation (patrol areas, dragon flight routes, hunting area for these lions etc.). That way it (the modeled space) is much more user-friendly (and author friendly) than the regular tesselation of the Hex-Crawl. Also, an area-movement style tesselation unconciously will diminish the tendency to stick to roads or road like linear feature: again it shows that for most people, utter freedom leads to 1-Dimensional solutions. Restriction leads, apradoxically, to greater freedom and exploration; as the dungeon did. So, to state my case: do NOT make a dungeon out of the wilderness. instead generalize the wilderness but keed the 2-Dimesnions of space. HEx-Crawls fail often, as they do not chunk phenomena but coordinates. Which again is very writer unfriendly and user unfriendly. Thus, the infinity of choices that leads to "stick-to-the-roads"-defensive actions is not avoided. Also geometric scale of hex-maps is often hard to map unto conceptual scale for laymen. The most luxurious way of DM ing of course is to let the players interact with a regularly tesselated maps, while you DM based upon hierarchical area-based notes and concepts. This is where the Wilderlands as published fail many DMs. I created the hierarchical areas myself, but that.was.a.chore. I just read the LAexandrinian's structure series, very nice! One concptual omission is indeed relevant here: There is not only micro and meso "levels" there are many scales in between! For RPGs the relevant scales seem to be: planetary-continental-imperial-kingdom-region/duchy-shire-county-town-hamlet/borrough-street/dungeon-building/lair-room/room. Note how hexes are very bad at going up or down the scales conceptually, as they are defined by regular geometries. Geometrically, they are a breeze to scale, make no kistake. but to create all the intermediary phenomenathat exist only in a certain scale band, they are actually counter-productive, as the hexes are blind to discrete groups of objects. Settembrini's talk of scale triggered a combination of two memories. One, last week, we’ve been playing in Melan's campaign and the party came upon an outdoors area. Not just a random hex or part of a hex, but the "Here Be An Adventure" kind of area. It's a valley running along a stream down to the coast, with, as far as we can tell at this point, maybe around half a dozen points of interest or so. The distances between these points, however, are pretty… well, perhaps, large. Getting from the far end of the valley down to the shore took over half a day, and travel between any two points of interest is measured in hours. As a player, I haven't thought anything about that until right now, when I suddenly remembered a real-life trip with friends I made to Dobogókő, a peak in a hilly area of Hungary, a number of years ago. Once in the forest, we saw three separate things that you could call a point of interest: an art installation from last winter, a random trail crossing with several barrels, boxes and tarps left behind and apparently abandoned by the BBC last year, and the wooden framework of what used to be Robin Hood's hideout when the BBC was shooting that series. The thing that contrasts this memory with D&D wilderness exploration is that all three of these locations were in no more than maybe 45 minutes' walk of each other on a round trip. The same not particularly long walk had a clear change in the terrain from "forest, flat ground" to "forest, heavily broken ground" – so the wilderness was actually a lot denser, with individual sites much closer to each other, than in D&D. I don't have any particular insights about this, but I thought I'll just add a note to the question of scale and the "density" of wilderness. I wish there were a lot more overground adventures with stuff at most a couple miles apart. It's a natural scale which sees very little use. Melan posed a problem, guardedly, and the responses have been predictable with varying degrees of insight. For me Melan's is a non-question, and I can't believe an experienced DM hasn't grappled with the issue in his earliest days. It's like hearing a beginner ask can we learn to do oil paintings by penciling in regions to be filled with potted colours. No. "For all the care I invest in my wilderness maps, my players still have an annoying habit of staying on the roads"
*There are no roads through wilderness*. That might even be the tersest definition of 'wilderness'.